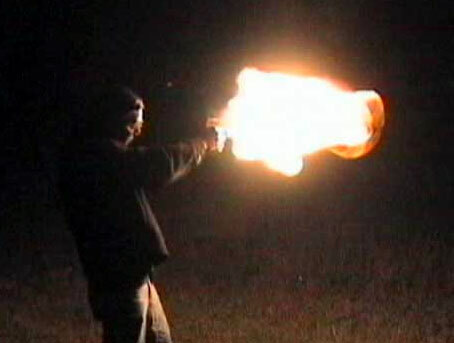 When I was looking for a secundary GAS powered gun, I thought it should be small, lightweight, effective, and should not have a big GAS consumption. 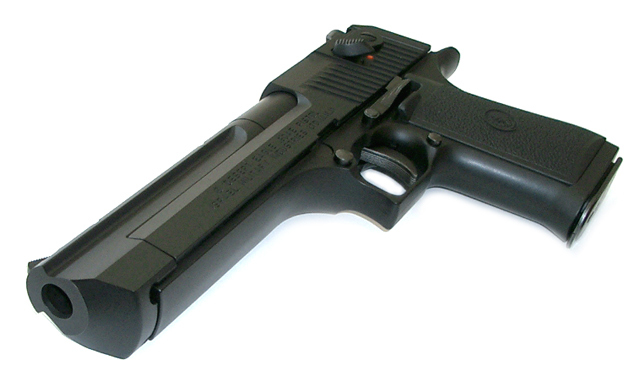 But I gradually come to realize that with the Glock 26 I not spook the enemy, rather entertained, because he would think that I go to him with my bare hands, despite the fact that the noisier weapon you have, the more your enemy will afraid :) And as I browsed the internet, I was still in sight of that famed the Desert Eagle. 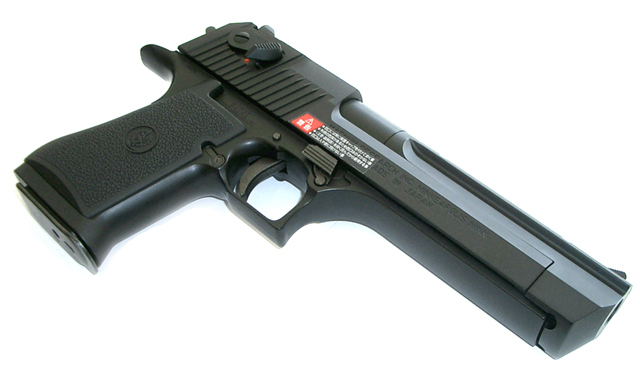 Desert Eagle here Desert Eagle there ... And as the eagle circling above the desert, waiting for an opportune moment, neither Airsoft Desert Eagle I did not sleep ... and when Desert Eagle so Hard Kick from Tokyo Marui... Well, and they showed a lot hat down. From the view is it the killer requesting blood, it's a monster lurking at the victim, it's sleeping dragon who can not wait for opportunities to spewing flames ... but what about the power in real? I must say I was very pleasantly surprised. 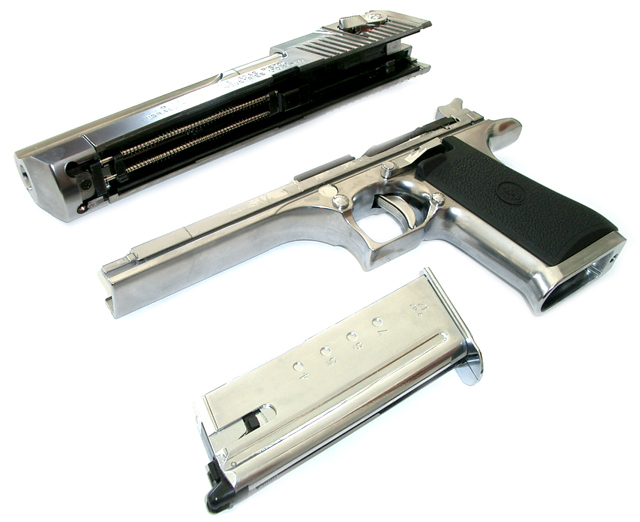 This piece completely denies all allegations that revolvers are imprecise and unstable performance. Barrel length is a little over thirteen centimeters (136 mm). That does not suspect a great accuracy, but the opposite is true, I do not know how this is possible, but using 0.25 g BB even in moderate winds can hit the target with dimensions of 20x30 cm! 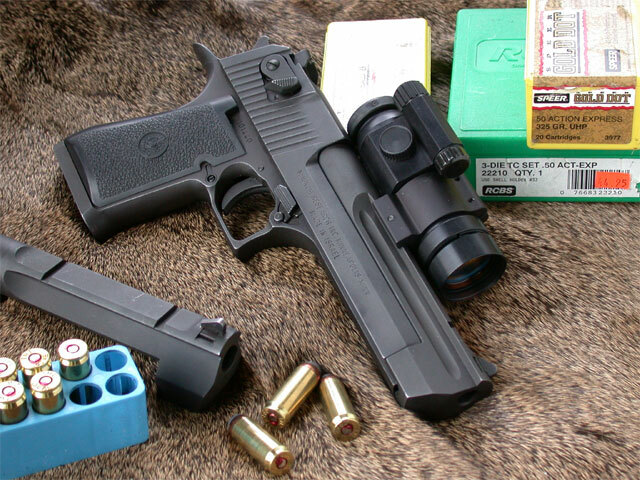 Sometimes it's a problem for my M4 and this shameless Desert Eagle makes it just :) The shooting I have no complaints at CQB intervention is confident in the woods I'm not afraid too. 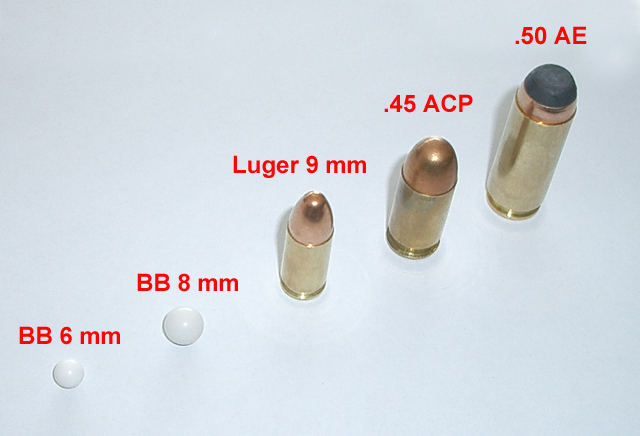 Perhaps only I add that 10m can all BB from the magazine (27 + 1) placed in a space of 10x10 cm in a few moments ... the human target is not no big deal. 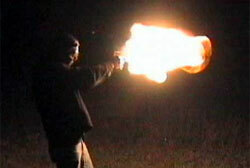 A bit of education: BlowBack is a device that handles stretching another ball into the chamber and "throwing" slide. 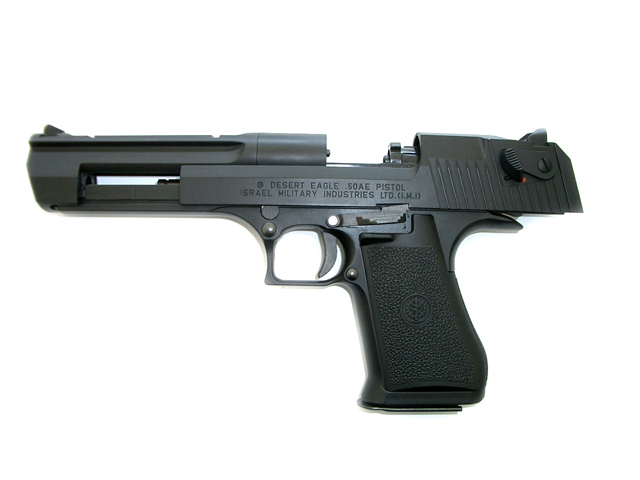 About the BlowBack this Desert Eagle could be writing essays and hymns. It is about the so-called Hard-Kick, something in terms of reinforced BlowBack. If you think it's just a marketing gimmick by Tokyo Marui, you are wrong! And you will soon discover how badly ... You may be wondering why it, you will simply wear out faster parts, it will guzzle more GAS and thus miss anything. 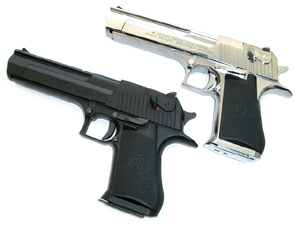 I also shared this view, but came that fateful day and I'm a Desert Eagle fired first ... pull the trigger, you will hear the deafening roar of BlowBack and the hands feel a kick, they never dream expact. 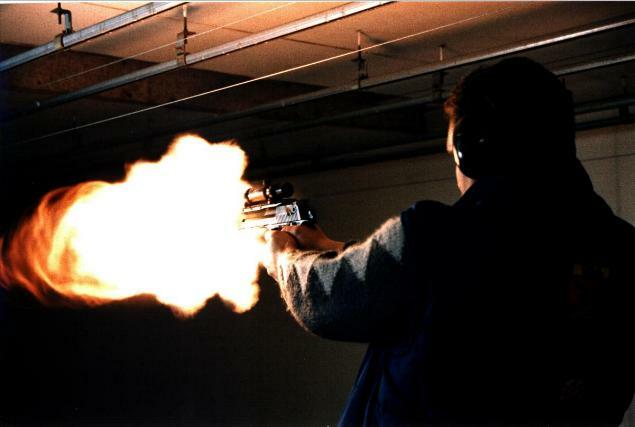 Immediately it stretched your mouth from ear to ear and you can not stop loving it, it is sharply addictive drug, and instead of one shot you will shoot whole magazine already for that feeling! Consumption of you suddenly do not care ... Another thing is that if Desert Eagle from the first sight commands respect, this BlowBack enhance his respect to the other! Foes flee before the sound and if you surprise someone from a backup, he will probably need new underwear. It's predator who wake up deaf and eats children! 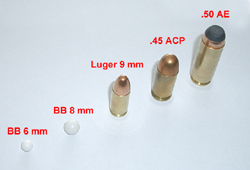 It is also interesting that despite such a powerful BlowBack, shoots a gun at one filling GAS HFC Super Power Green Gas two and a half to three full magazines, it is on average 80BB !! Is not it great? It is great! Consumption also depends on temperature, I counted these numbers at room temperature of about 22 degrees. Again, a bit education: Hop-Up is a device awarding fired bb backspin, thereby artificially straightened its ballistic curve, greatly improves range. 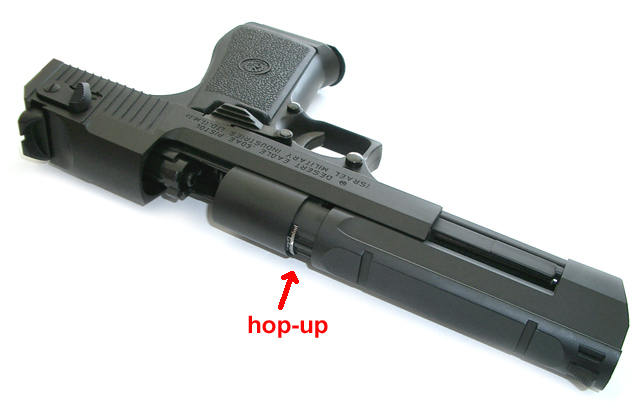 Hop-Up at The Desert Eagle is located under the "overlap of the chamber." Just fix to the rear, pushing the canopy backward and peers out at us tuning lever itself Hop. Debugging is easy with a relatively long run, allowing optimal settings under any circumstances, as for BB 0.20 g and 0.25 g BB, which suit better for shooting longer distance.